Northern exposure, aggressive snowmaking and hard manmade snow crystals are helping some of the bigger ski resorts deal with climate change, but smaller operations are under threat as the warmer winters will lead to less snow on the ground. The scientists published their findings in the journal Tourism Management. Regional operations at lower elevations that either can’t adapt or afford to adapt to warmer temperatures are at risk. In the West of the USA, water scarcity and drought could have a big effect, as ski areas may lose the ability to make snow. In the Northeast, increasingly unreliable winters could affect more than half of the region’s 103 active ski areas. Shortened ski seasons and a lower probability of ski resorts being open during the holidays could spell the doom for smaller resorts. By 2039, only half of the ski areas in the Northeast will be able to maintain a 100-day season, a measure of economic viability in the ski industry. Smaller, southern-tier resorts, closer to major metropolitan areas, are even more at risk. Within 30 years, there will be no ski areas in Massachusetts or Connecticut that will be able to maintain a 100-day ski season and only a third of the resorts in New York could expect to be regularly open during the holidays. The big mountain resorts in Maine, New Hampshire, and Vermont are expected to strive and even gain more clients as a result of the smaller ones failing. But for the majority of ski resorts to survive, they will need to become more sustainable by increasing energy efficiency and even creating their own electricity with alternative sources, like wind farms. In the 1980s and 1990s, nearly 600 small, locally owned and public ski hills across the Northeast closed because they couldn’t afford to make snow. And while investments in state-of-the-art snowmaking technology and increased sources of revenue available for adaptation may help some resorts, the winter tourism industry as a whole has experienced an estimated $1 billion loss with 27,000 jobs lost over the past decade. 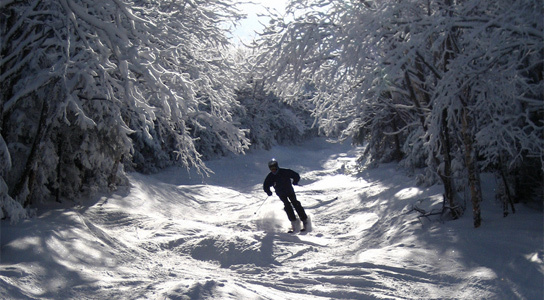 Be the first to comment on "Smaller Ski Resorts Threatened By Warmer Winters"